Enhancing an old-fashioned pillow fight with physical computing and the experience of auditory and visual feedback. The first rule of Pillow Fight Club is that you do not talk about Pillow Fight Club. The second rule of Pillow Fight Club is to make an occasional exception to rule #1. Pillow Fight Club takes the simple gameplay of an old-fashioned pillow fight and integrates it with physical computing components of Arduinos, accelerometers, XBee radios, and Processing. It encourages the participants’ fighting spirits by rewarding energetic action with an experience of auditory and visual feedback in the form of an old-school videogame. 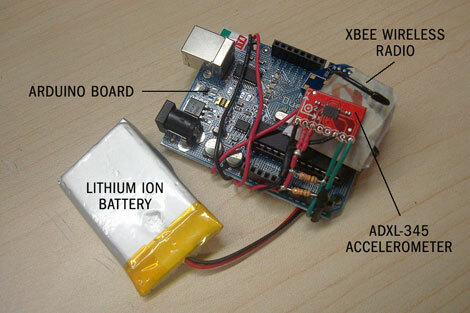 An accelerometer is carefully soldered onto an Arduino board and is powered by a rechargable battery which detects movement and velocity on three axises. This hardware is placed inside a protective shell which in turn is placed inside a pillow. The XBee radio wirelessly transmits that data to a receiving radio unit plugged into a laptop running Arduino and Processing applications. 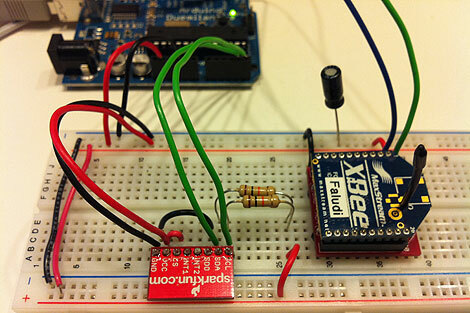 Arduino takes the accelerometer input and translates it into neat, readable byte packets while Processing turns those incoming bytes into sounds and graphics. Hits (as well as fast swings) are detected and visualized as explosions on a videogame-like interface while the players can hear a variety of fun noises including punches, breaking glass, rattling swords, meowing cats and neighing horses. 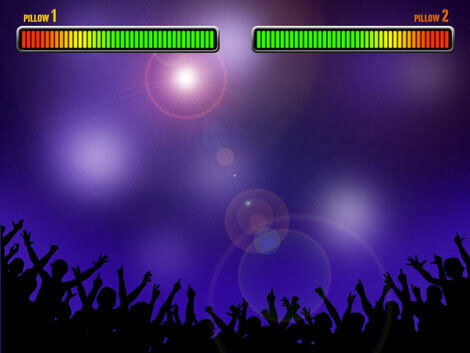 The player that scores the most hits to fill up their game meter wins the pillow fight. In addition to figuring out the technical aspects of hardware connections and programming, we thought about the parameters of a pillow fight: how they start and end, how they are won, what kind of feedback can enhance the game. 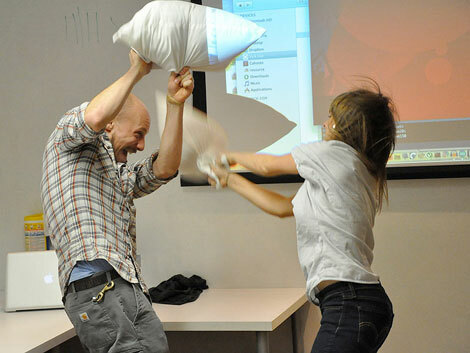 A video presents the story and frames the concept of this 21st-century pillow fight. The last rule of Pillow Fight Club: If this is your first night at Pillow Fight Club, you HAVE to fight.